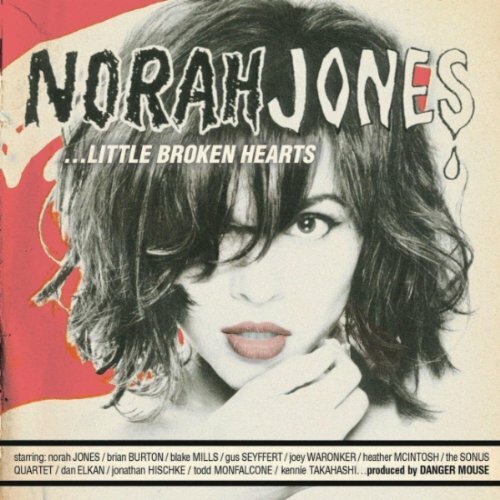 Norah Jones collaborated with noted pop/rock producer Brian "Danger Mouse" Burton on the Rome "soundtrack" album and the sparks that flew during those sessions led to him working with her on Broken Little Hearts and all the rules for Norah Jones records past have been cast aside and nothing is off limits, not even her voice. I was open to and excited about the new sonic paintbox Danger Mouse would bring with him because I am obsessed with "Seasons Trees" from Rome. I didn't expect Norah's voice to be treated like one more instrument in the mix to be manipulated and I wasn't happy about it. What kind of moron wants to desecrate and distort one of the most pure and lovely voices on earth? That's like spray painting a goatee on The Mona Lisa or Ted Turner's blasphemous decision to colorize classic black-and-white films; it's depraved and wrong… even if it works. Broken Little Hearts has more going on than new sounds. As the title implies, our dear Norah is picking up the pieces after a failed relationship. "Good Morning" gently introduces the new sonic surroundings thematic tone of the record. "Good morning, my thoughts on leaving are back on the table, I thought you should know" are her first words to us and we're able to soak them in while being eased into the soft, rounded atmosphere of the music. Guitar, piano, and cello are digitally filtered to create a soporific haze. The kid gloves come off on the next song, the beat-driven "Say Goodbye." No one will confuse the song with something from Black Eyed Peas but the processed vocals and computer-generated effects are a drastic departure from the organic sounds of her earlier work. It's a compromise approach that leaves a lukewarm, unremarkable impression. The modernist approach is far more successful on the album's first single "Happy Pills." Fortunately this sonic experiment spends more time creating engaging soundscapes for Jones' voice rather than attempting to morph her into a pop star. "4 Broken Hearts" and "Out On The Road" have the strongest resemblance to the work Jones and DM did on the Rome soundtrack, particularly the Spaghetti Western twang and clang of "Hearts." "Take It Back" opens with a dark, moody piano figure with a tale of regret. She's looking for an escape route as the song opens and a way to erase from her mind what's just happened as it ends. The most unexpected revelation after several listens is depsite all the sonic trickery and digital wizardry, we're left with a Norah Jones record. I anticipated something more alien and alienating but the pace and tone remain familiar -- heavy on ballads and slower tempos -- and the voice remains among the most pleasing on the planet even when it's toyed and tinkered with. I'm not saying I'm happy about it but in the context of the record, it's only a misdemeanor rather than a felony. I like that Broken Little Hearts is a departure, that there are exotic textures creating sonic scenery to surround and adorn her voice and tales of heartbreak. The big surprise is how comfortable it all feels.